In it, I assume you are arriving midday, staying 2 nights, and leaving in the morning. Saigon is just 4 hours away, so it’s possible to stretch out your time here by taking an early bus in, or leaving later in the afternoon. For more information about traveling in Can Tho, including how to get there, where to stay, where to eat, and suggestions of where to go next, check out my budget guide to Can Tho. After checking into a hotel, go for a walk along the riverside. There’s a park that runs along it that has a statue of Ho Chi Minh. Right up against the water is an upstairs cafe that is a great place for a ca phe sua da and some boat watching. It’s next to a loading ramp that sees quite a bit of action. Going south along the river, you’ll reach Nguyen Thai Hoc or Vo Van Tan, the boulevard like streets that runs perpendicular to the water. At night, the space between them will be filled with street food and booths to buy knick-knacks. Past it, still heading south, you’ll eventually come to the local market. The Mekong Delta is famous for its fertility. It’s known as the rice basket of Vietnam. Two-thirds of its land is farm land. Rice, vegetables, fruit, and fish from this area help to feed Vietnamese people all across the country. In fact, it’s said that 46% of the food in Vietnam is comes from the Mekong Delta. While at the market, pick up some unique tropical fruit to sample. Many years ago, we put together this guide to Vietnamese fruit that will help you figure out what you’re eating and how to eat it. Cai Rang is Can Tho’s amazing floating market. It’s a must-see in Can Tho. There are organized tours that can be booked from the tourist office by the river, but everyone I’ve spoken to that did that didn’t end up having a good time. Instead, book with a local boat lady. You’ll get a private boat that’s narrow enough to go down the canals. While there isn’t an official place to book these tours (in fact, they aren’t actually suppose to be doing them), it should be easy to find a ride. Just hangout in the area where the riverside street starts to turn into the market (Hai Ba Trung and Ngo Duc Ke). Someone will surely approach you. While this person will probably speak English, don’t expect your driver too. Before settling on a price, ask to see the boat. They’re pretty much all the same, and I doubt he’ll show you the exact one you’ll be taking, but it’s a fun little excursion down an alley to the river. It’s possible to negotiate the price down to 350,000 VND (around $15), but you’ll need to negotiate hard. Most people have no problem getting it for 400,000 VND (about $18). You’ll have to pay half upfront, and you’ll probably be told to meet at the alley the next day at 5:30AM. I know it’s early, but you’ll be glad you did this. When that’s settled, you can walk up Nguyen Thai Hoc (the night market street), which turns into De Tham and eventually stops at Xang Thoi Lake. This is a good place to watch the sun come down. There are many cafes around the lake. When you’re hungry, head back towards the river, but take your first right down Hem 14, it’s a small alley-like road, so be careful not to miss it. Follow that past Ly Tu Troung and onto Hem 1. This is hotpot alley. Here you’ll find a bubbling cauldron of broth heated at your table with noodles, vegetables, and your choice of duck (vit), seafood (hai san), goby fish (ca keo), or river fish with a sour broth (chua). Feel free to explore the alley a bit. There are many places to choose from. Of course, the busier ones are busy for a reason. When you’re done, you can head down to the night market, but be sure to get a good night’s sleep so you’ll be up the next morning for your boat tour. Start the next day off by contemplating whether this floating market thing is worth getting out of bed at 5AM for. Ultimately, decide to not be a lazy bugger. At around 5AM, boats filled with fruits and vegetables gather in the same spot to sell and trade their bounty. The market is about 500 meters long. Watch for the long poles that advertise what the boat is selling, and the sticks that the sellers use to pass items over. You can find boats selling coffee to get a cheap cup of wake-me-up. It’s an amazingly colorful experience, with fruit being tossed around, people yelling, and plenty of amazing photo ops. Kid watching some pineapple tossing at the Cai Rang floating market. After a few passes through the market, you’ll be taken down a canal that’s lined with extremely modest homes. In my tour, I was dropped off at one point and told to walk back along the canal. At first, this seemed sketchy, but the lady met us a short ways back down the canal, where she took us on foot to a rice paper making workshop. You should be back in Can Tho around 9:30AM — maybe still in time for the hotel breakfast. If you are staying at the West Hotel (highly recommended), be sure to take advantage of their free-to-use bicycles. Otherwise, I recommend renting a bicycle for around $5 a day. Ask your hotel about it (I’m pretty sure Kim Lan Hotel has them). If they can’t hook you up, they should at least be able to point you in the right direction. If all else fails, try Kim Tho Hotel. There are many places to ride to around Can Tho, so feel free to design your own ride using Google maps (the satellite images will help you find cool areas), but here’s an example of a trip I took that went by fruit farms, rice fields, and along quiet rivers. It also involved a short ferry ride. 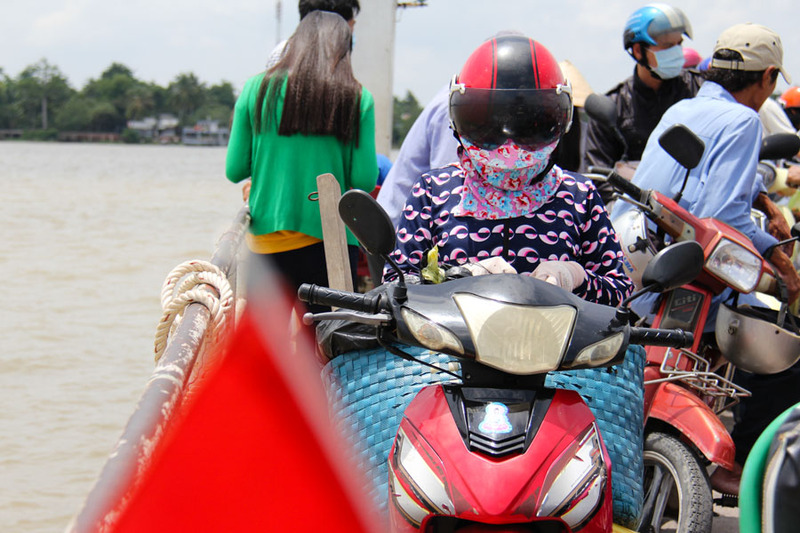 Taking the ferry across the Hau River in Can Tho. Parts of this ride are pretty secluded, so make sure you bring water and precise directions. There will be plenty of houses around with locals wandering about, so if you get into trouble just ask for help using your charade skills, or simply say ‘Can Tho’ if you get lost. On your way back, stop at the area after the first bridge, where the large roundabout is. There are a few riverside restaurants where you can grab lunch. Just take the road that go towards the river off of the roundabout. By the time you get back to your hotel, you’ll be pretty tired. Rest at one of the many cafes, or your hotel. That night, if you’re not too tired, head over to Le Loi street (you rode along this street on your bicycle tour). A taxi will cost a few bucks. This is the newest party area of Can Tho. There are a few beer clubs along here that serve food and turn into a club-like atmosphere. Vietnamese girls pretend to spin records, people drink way too much beer, and everyone is pretty happy. It’s not for everyone, but if you arrive early enough (they usually open at 4:00 or 5:00) you can get a meal in without all the chaos, and then decide whether you want to stay. A few options on Le Loi: Lop Cop Beer Station, Gemini Pub, Pop Beer Garden. Alternatively, you can get a decent meal, within walking distance of your hotel, at GONY (Glory of New York). They serve some Korean and Western food (pizza, noodles, salads, sandwiches, etc). After your meal, you can get a 90 minute massage in the spa upstairs for around $15. 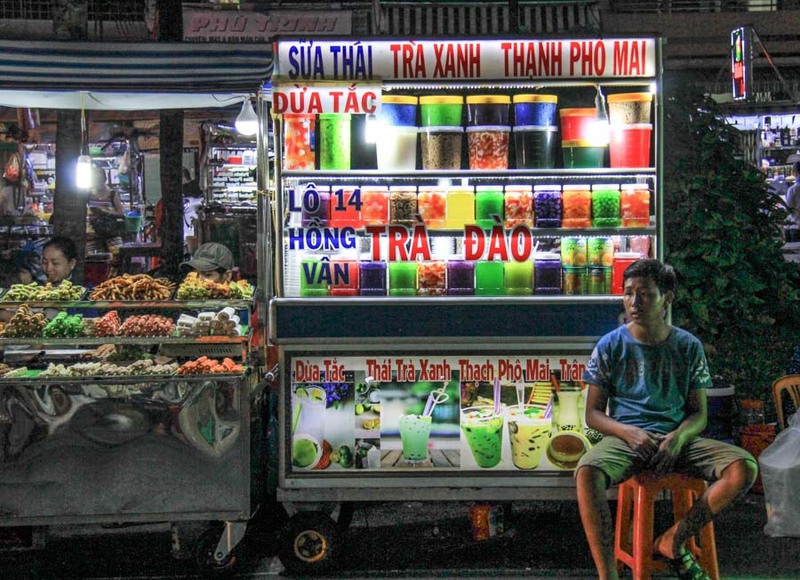 With your last few hours in Can Tho, head out for a morning walk while searching for an authentic Vietnamese breakfast. I clearly remember doing this in Can Tho the first time I ever traveled Vietnam. It’s a moment that sticks out in my head – one that will never be forgotten. I may have fallen in love with the country during this breakfast. I can’t say exactly where to go – just walk the streets until you find some plastic stools and a lady parked out on the sidewalk with a big pot. These ladies will often change up what they make from day-to-day. I remember having an amazing duck noodle soup. Order a bowl and have a seat. Soak in the atmosphere around you. As you slurp up the amazing soup, you’ll feel what makes the Mekong Delta so amazing. The very bowl of noodles that changed my life.